I like James White. 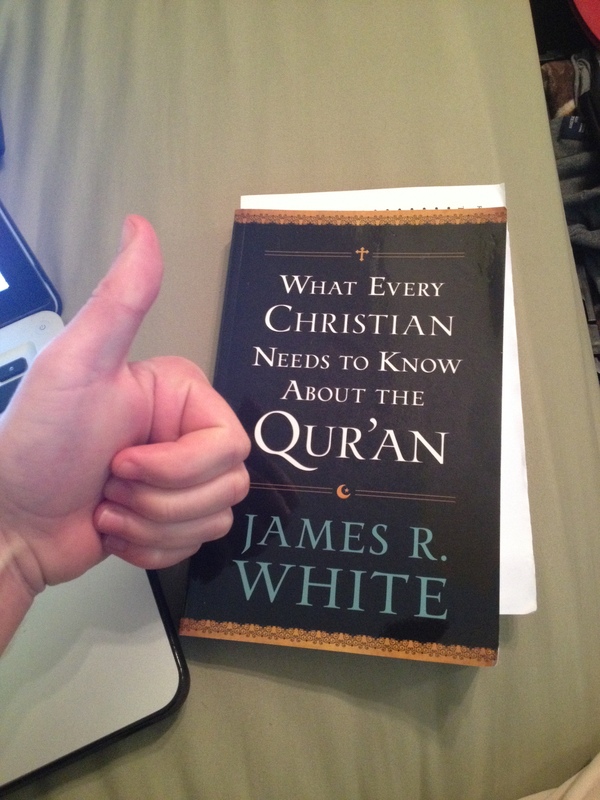 I know all of my posts on here have been critical but I do enjoy listening to the Dividing Line, his work on textual criticism is great, his material on the Trinity has been extremely useful, and I’m currently working through his latest book on the Qur’an. That being said, like he admits in the May 8th Dividing Line, everyone is a mixed bag. When it comes to issues of philosophy, especially Molinism, Dr. White is rough around the edges and makes some significat errors due to misunderstandings. It’s especially frustrating because he stresses all the time the need to “hear [people he disagrees with] in their own language” . Molinism is rather philosophically robust and one can’t hear Molinism in its own language with philosophical misunderstandings. It is worth mentioning that in this latest podcast, Dr. White’s comments reflect a more balanced presentation of Molinism than came across in the previous podcasts which I addressed here and here. So, I want it to be clear that I’m not attacking Dr. White personally and I don’t think that these percieved mistakes reflect on his character. Now that I’ve got that out of the way, let’s look at what he has to say about Molinism. This remains Dr. White’s biggest objection to Molinism and it permeates all of his other objections. The grounding objection, for those uninitiated, is the rejection of middle knowledge on the basis that there is no grounding for counterfactuals of creaturely freedom. In Dr. White’s words, how does God know what some creature, Sam, would do in certain circumstances? (For a more details on the grounding objection, consult this entry on the Internet Encyclopedia of Philosophy). The grounding objection is where Dr. White derives his “card-dealer” argument. The “card-dealer” argument is a rhetorical zinger that Dr. White gets from conjoining the grounding objection with a bad analogy Dr. Craig made some years ago. There are lots of moving pieces here so I’ll give a summary right quick. Grounding Objection – How does God know these counterfactuals? Where do they come from? Dr. White’s Card Dealer – Since God doesn’t determine the truth of the counterfactuals of freedom, they must come from something or someone else. Who is the card dealer? He’s the one we should be worshipping. 1) We appear to know counterfactuals and employ them in our daily lives. In fact our plans are inextricably linked with such counterfactuals. An example would be “If I were to pull out into traffic, I would make it across the intersection”. 2) It is plausible that the Law of Conditional Excluded Middle (LCEM) holds for counterfactuals of creaturely freedom. Moreover, the Molinist project itself is one of defense and not one of theodicy against the notion that God’s sovereignty and human freedom are mutually exclusive. As long as it is epistemically possible for these counterfactuals of freedom to exist, the Molinist is successful. Thus, the Grounding Objector is pushed from saying “where do these counterfactuals come from?” to saying “it is impossible for these counterfactuals to exist” which is a considerably stronger proposition. Craig gives more comments paralleling Molinism to the Special Theory of Relativity in his 2003. In any event, the Grounding Objector is at minimum pressed for more information which leads to the next response. Second, Craig (with other Molinists) points out while that the grounding objection is one of the largest and purportedly potent objections against Molinism, it is easier raised than defined. He remarks “the irony is that this allegedly powerful objection has virtually never been articulated or defended in any depth by its advocates” (Craig, 2001). So, while it may be easy for Dr. White to casually say “where do these counterfactuals come from?”, when pressed for precision, Craig claims no one has stepped up to the challenge. While I think William Hasker has made some progress since Craig’s original 2001 article, Dr. White has not been sufficiently precise in his formulation of the grounding objection. Craig’s next step is to postulate that Grounding Objectors tacitly presuppose what he thinks is an untenable model of truth maker theory. I’ll go into more detail on this component in the next section. A truth–maker is typically defined as that in virtue of which a sentence and/or a proposition is true. According to Peter Simons, “Truth–maker theory accepts the role of something which makes a proposition true, that is, whose existence suffices for the proposition to be true. But it does not automatically pronounce on the ontological category of the truth–maker.” “Indeed,” he insists, “anything whatever is a truth–maker.” But historically the orthodox view has identified truth–makers with such abstract realities as facts or states of affairs–more often than not, the fact stated as a proposition’s truth condition, as disclosed by the disquotation principle. Thus, what makes the statement “Al Plantinga is an avid rock–climber” true is the fact that Al Plantinga is an avid rock–climber or the state of affairs of Al Plantinga’s being an avid rock–climber. Now we immediately see the potentially misleading connotations of the term “truth–maker” for such entities. For making sounds like a causal relation between a truth–bearer and some concrete object, but truth–maker theorists are quite clear that the relation is by no means causal. An entity a makes a proposition p true if and only if that a exists entails that p. That truth–makers are usually conceived to be such abstract entities as facts or states of affairs underlines the point that a causal relation is not at issue here. That the relation between a truth–maker and a truth–bearer is not causal is especially evident if we require truth–makers for negative existential statements like “Baal does not exist.” According to Kevin Mulligan, Peter Simons, and Barry Smith, “Not only Wittgenstein, but indeed almost all other philosophers who have investigated the relation of making true, have felt compelled in the face of the problems raised by negative propositions to adopt an ontology of truth makers as special, non–objectual entities having a complexity which is essentially logical. Obviously a fact like Baal’s non–existence, which is sufficient for the truth that Baal does not exist, is not a cause of anything. Counterfactuals of freedom . . . are supposed to be contingent truths that are not caused to be true by God. Who or what does cause them to be true? Or, to put it more simply as Alvin Plantinga did: “It seems to me much clearer that some counterfactuals of freedom are at least possibly true than that the truth of propositions must, in general, be grounded in this way”. White seems to actually endorse this highly controversial system by positing that for every truth, there is a truth maker called “card-dealer”! However, I highly doubt that Dr. White has delved deeply enough into “man’s philosophy” to know what kind of theory of truth he endorses. Dr. White does not seem aware of these responses, fails to interact with any Molinist replies to the grounding objection in general nor Craig’s responses specifically, and seems to tacitly assume a highly controversial theory of truth making. White picks up on Craig’s comment that “none of these counterfactual statements actually exists” and then proceeds to inquire about how things non-existent things can delimit the range of possible worlds. I’ll leave it to Dr. Craig to tease out the causal relationship in his paper God and Abstract Objects (2012). Also, there are some copyright issues surrounding the material and I don’t want to write to John Wiley & Sons to get permission to reproduce any of the content here. This was Dr. White’s biggest blunder. Around the 29 minute mark, Dr. White quotes Dr. Craig saying that God did not volitionally select logically necessary truths either. Now, White calls this “natural law” (which I think is a misnomer) and then conflates this with physical laws! White lumps “the laws of logic, mathematics, and calculus” in with things such as Planck’s constant and Avagadro’s number. I want to be as charitable to Dr. White as I can but this is seriously an amateur mistake. Laws of logic are not even remotely in the same category as physical laws. The laws of logic are necessarily true. That means it’s literally impossible for them to be false. Can God change the laws of logic? Only if you are some kind of hyper-Cartesian that thinks God can make a four-sided triangle and can simultaneously exist and not exist while creating a rock too heavy for him to lift. Seriously. If you say God can alter the foundational rules of logic, you have surrendered any chance at coherency. On the other hand of course God can create the universe with different constants and quantities. There’s nothing metaphysically necessary about the way our universe is structured. Just for good measure, here is Craig’s version of the Argument from Fine-Tuning that argues specifically against the physical necessity of the preconditions of the Big Bang. Early in his critique, White mentions that “what [he does] flows from [who he is] and [who he is] is what God made [him] to be” and from this fact, God knows the counterfactuals of freedom concerning James White. Interestingly enough, this comment is completely consistent with the “conceptualist model” of divine knowledge that Molinism generally presupposes. The Molinist can reply that God’s self-contained, innate knowledge contains such exhaustive accounts about every possible individual essence that God knows just what that creature would do in any circumstance. To my knowledge, this is the position of Craig and even Luis Molina himself! It’s nice to see that Dr. White is addressing Molinism and giving it more attention. I find his criticisms intriguing but misguided and outdated. I’m also happy to see him giving a fairer treatment to the tenets of Molinism. Ultimately, Dr. White’s rejection of Molinism is rooted in philosophical misunderstandings including unawareness of the responses to the grounding objection, confusion about the nature of abstract entities, and conflation of contingent physical laws and necessary logical laws. Really nice post here! I need to read through it again. Just to clarify: I did not forward any question to Craig. They simply used my blog post for a foil to look at molinism. Dr. White! I’m honoured to have you comment on my humble blog. Like I said above, I really admire your work and I’m an avid listener of the Dividing Line even if we disagree about Molinism. There’s a crucial error in your comment though, Dr. White. Namely, I’m not addressing the Biblical concerns with Molinism. I admittedly left the Biblical concerns on the table to focus on your philosophical missteps and said as much in this article’s introduction. You’re more than welcome to use the content here as you would like but please do not portray my article that explicitly and exclusively focuses on philosophical issues as unbiblical. These are philosophical responses to philosophical objections. Yes, sir. I completely agree that Molinism is subject to Biblical critique. However, your objections that I addressed here are not found in divine revelation, Dr. White. If your chief objections to Molinism are strictly Biblical, then I don’t see why you bother with things like the grounding objection. As I will show on the DL today, the grounding objection IS biblical because the Bible DOES address God’s relationship to His creation. That is why no one—ever—in all the history of the Christian faith, ever came up with this philosophical concept by reading God’s Word. It came from outside, it will always come from outside, and hence can never truly be embraced faithfully. Dr. White, it seems to me that your construal of the grounding objection presupposes a theory of truth-making that also posits God volitionally determines the necessary laws of logic. Will you discuss in the DL your theory of truth, whether or not it is Cartesian and provide a defence? Second, will you address if God can actualise a logical contradiction? I definitely agree that we need to be subject to divine revelation. However, the specific critique given here is in response to the grounding objection. Is that objection found somewhere within Scripture? It was said that patriotism is the last retreat of the scoundrel. “Robust” in reference to Molinism is one of those words like “enriching” and “enhancing” that attach like limpets to dubious notions. You gentlemen familiar with Occam’s Razor — do not multiply entities unnecessarily? “Wowsza!” guys — don’t take yourselves and your exalted philosophy so profoundly seriously. And what did the Gospel and the glorious everlasting God do without Molinism? How did the word of God grow and increase and the kingdom of God advance without Molinism and WLC? I’m not sure what you’re trying to say about Occam’s Razor. I’m familiar with it but I don’t see how it’s relevant here. Molinism serves to break the dichotomy of human freedom vs divine sovereignty. Middle knowledge is a plausible candidate. So, Molinism actually only posits one explanatory premise; that seems about as parsimonious as an explanation can get. I try not to take myself too seriously; I’m just a no-name on the internet. When I defend Molinism, I don’t view it anywhere near on the same level as defending the Gospel. Maybe you can help clear something up for me. I tend consider the Molinism view as the more plausible of the available options. I listened to the recent podcast in which Dr. White responds to your blog post and yet again it seems that Dr. White was showing that he does not understand what he is critiquing. Molinism as you know is very nuanced and robust and requires very careful and rigorous thinking. Dr. White kept bringing up the point that God knows him because God created him and therefore has complete knowledge of Dr. White. To me this sounds like God puts your parts together that make you who you are and therefore in a mechanical type of sense he knows you and what you will do. Like an architect knows the building he designed. If we indeed have libertarian freedom then it means that the grounding of a counterfactuals resides in the creature with freedom, in the same way that counterfactuals about Gods freedom are grounded in him. The “card dealer” (poor choice of words) to me is just a result of contemplating free creatures who do not exist. So if God creates a free-creature then that creature is now a truth maker in the same sense that God is. God makes choices that are grounded in him. In the same way that brute facts pop into some metaphysical/conceptual existence, when you contemplate free creatures. True propositions of creaturely freedom pop up into existence when you contemplate them in the same way that 2+2=4 when you think about it. Does this make sense? Am I making a misstep? I don’t have any philosophical training I just listen to Craig and Plantinga a lot. I wonder if Dr. White thinks God has the ability to create a free creature. As a caveat, I don’t have much training either; however, I think you’re correct in saying that as libertarian creatures, we function in some way as the truth-makers of CCFs concerning ourselves. Concerning your second point (“So if God creates…when you think about it”), I would caution against the use of “pop into existence”. These particular propositions don’t actually exist as, for example, Platonesque abstract objects. The post that gave you your fame. Thanks for posting this. I heard James White’s response to your article on his podcast. I was disappointed that Dr. White tried to engage with you and your summary statements instead of responding thoroughly and directly to Dr. Craig’s work. For what its worth, I do not think that Dr. White established in that day’s podcast, as he said he would in the comment above, that the grounding objection is biblical. He seemed to simply fall back to just saying something like “molinism is false because it is not taught in the Bible and therefore there could not be grounds for counter factuals of creaturely freedom.” But this is not the philosophical objection known as the grounding objection which Dr. Craig was responding to. If Dr. White were to construe it as such an argument it seems to me that it would be a textbook case of question begging because Dr. White would be saying in one of the premises of the argument that molinism is false (or that Calvinism is true) in order to show in the conclusion of the argument that molinism is false. Good arguments just don’t do that. Thus it seems to either be merely a biblical argument against middle knowledge or a question begging version of the philosophical argument known as the grounding objection. Dr. White has not shown how it can be both.